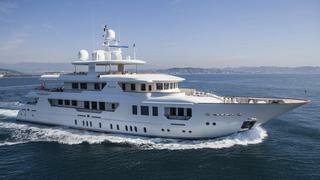 The 45 metre motor yacht Pride, listed for sale by Pedro Millet at Yacht Marine, has had a €2.2 million price cut. Initially commissioned to be built by Spanish yard Viudes Yachts, her steel hull and superstructure were completed in Barcelona before she was shipped to Mondo Marine in Italy for final fit out of electronics, teak decking, interiors and paintwork before she was launched in 2013. Lloyds classed and MCA compliant, her design offers very large exterior spaces, including a voluminous sun deck and beach club. The vast sun deck is ideal for al fresco entertaining, relaxation and dining, with a full wet bar, fridge, ice maker, and Teppanyaki grill along with ample seating and lounging areas. An interior in classical style has rich cherry wood paneling and flooring contrasted with beige upholstery and she accommodates 12 guests in six cabins. These consist of a full-beam master suite with two side balconies, a full-beam VIP suite, two doubles and two twins, all with full en suite facilities. Pride is powered by twin Caterpillar C-32 engines giving a top speed of 14 knots, a cruising speed of 12.5 knots and a range of 5,200 nautical miles at 10 knots.